Discover Lisbon, one of the most scenic cities in the world, and walk along the streets of Cascais, a cosmopolitan place which still retains a certain aristocratic atmosphere. 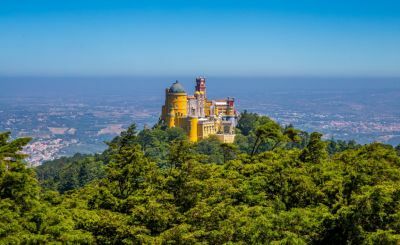 In the centre of Sintra stands the National Palace, with its beautiful painted rooms and huge pair of conical chimneys, the village´s ex-libris. This palace combines features from the Moorish, Gothic and Manueline styles, in keeping with the different constructions added to the original building. Of this building there still remains the Arab Room (lined with unusual and magnificent azulejos, although these represent only a small part of the collection of azulejos to be found throughout the building). Many of the rooms have been named after the paintings on their ceilings, such as the Swans Room, the Room of the Sirens, the Magpie Room or the Room of the Coats of Arms. The conical chimneys visible on the outside of the building are the most characteristic feature of the town of Sintra. Cascais is a lively, cosmopolitan place which retains a certain aristocratic atmosphere. It is worth a walk along its streets, with their excellent quality shops, or spending some time relaxing on one of its numerous belvederes. A natural curiosity on the way out of Cascais is the Boca do Inferno (Hell´s Mouth), a recess of the coast surrounded by craggy rocks and caves, providing a fantastic spectacle when the sea dashes against them on stormy days. Your driver and guide will take you to your Hotel or cruise ship and say the final goodbye.